What is inside this cute little box? Hey there! I could not wait to post these goodies! I am a busy mama and sometimes tbh I have no time to shampoo/condition my hair, shave my legs, pits..etc LOL and just shower in general. Gross I KNOW!!! but hey…this is a GAME CHANGER! woot! So what is inside of this cute box? The shave gel is perfect size (as the rest) for traveling Or the gym even. I want to for sure take this with me when I finally do get a weekend away! haha. It smells really good too. 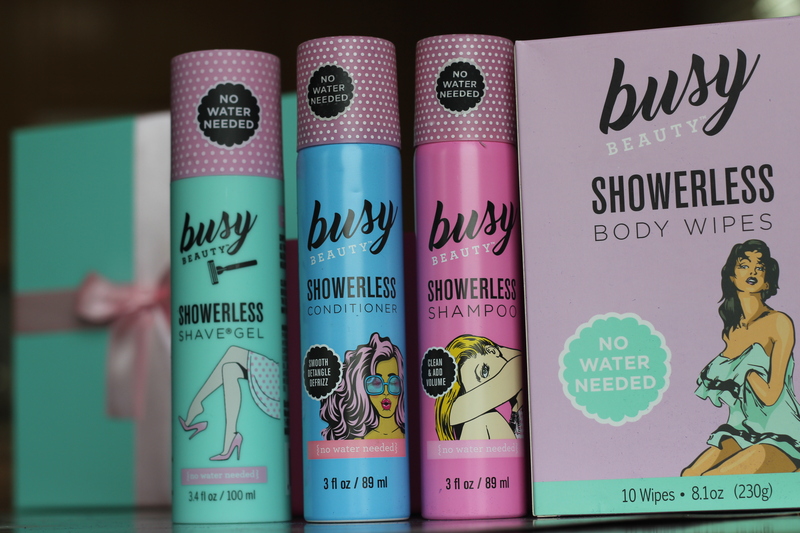 It has No parabens, no alcohol, vegan and cruelty free. I also have sensitive skin and get razor burn like no other and I had no issues with this! Plus it was really moisturizing! The body wipes are thick wipes and help keep you odor free and is safe for all parts of your body! The scent is almost like an orange to me. A citrus scent overpowers which I actually like! Just pop these in your bag and get going! Seriously the shampoo smells amazing and the conditioner really does help with frizz and detangling! YASSS!!!! Do I Recommend these products? Thank you busybeauty.com for providing me with these samples to share.